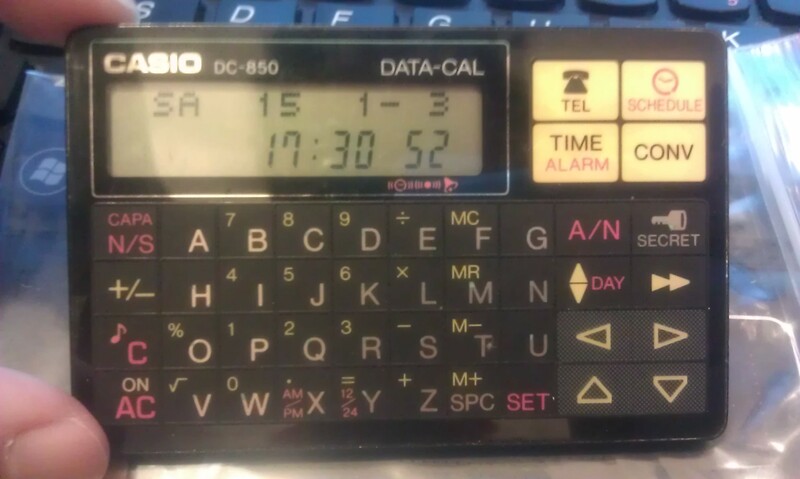 From informal sources the Casio Data-Calc DC-850 was introduced in the year 1996. It is a credit card sized calculator and data bank (terminology from those days) hybrid. So this is almost a 18-year product. Fortunately mine is still functioning. By today’s standard there is absolutely no market for this sort of product, as anyone have a smartphone will carry processing power astronomically surpass this DC-850. Yet I still admire to this day the beauty and engineering efforts built within this little calculator. The responsiveness, easy-to-use, no non-sense design and features, all in such a small package. The craftsmanship is so well this sample lasted to date and is still working flawlessly. All the keys are still in good shape. The basic outlook. There seems to be a gold color model. Mine is black. There are two lines of display, with the first line a dot matrix that can display alphabets and the second line is numeric segment. Back cover opened exposing the internals. 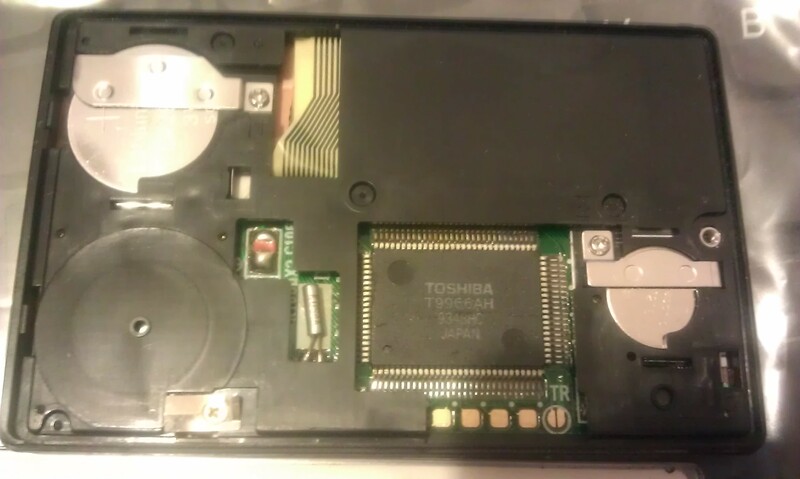 There are two coin cell batteries, the main being a CR2016 and the other for backup is CR1216. 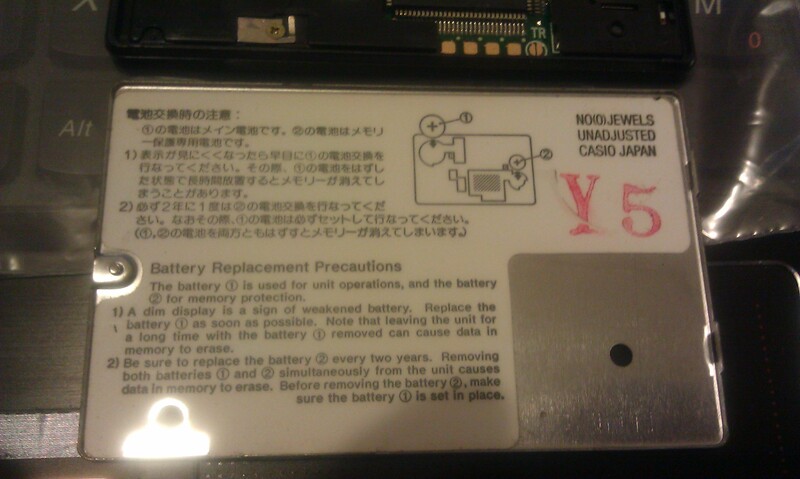 The inside of the back metal cover is nicely printed with the instruction to change battery, in English and Japanese. A small screw driver is required to open the back cover, and the little screw is designed to kept attached to the cover while it is loose, so there is no worry losing it. Same design for the two metal battery covers. 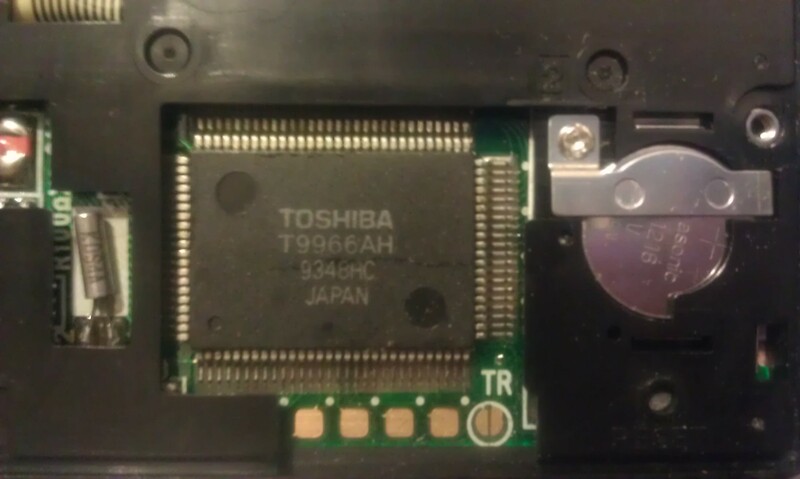 Close up of the processor (?). 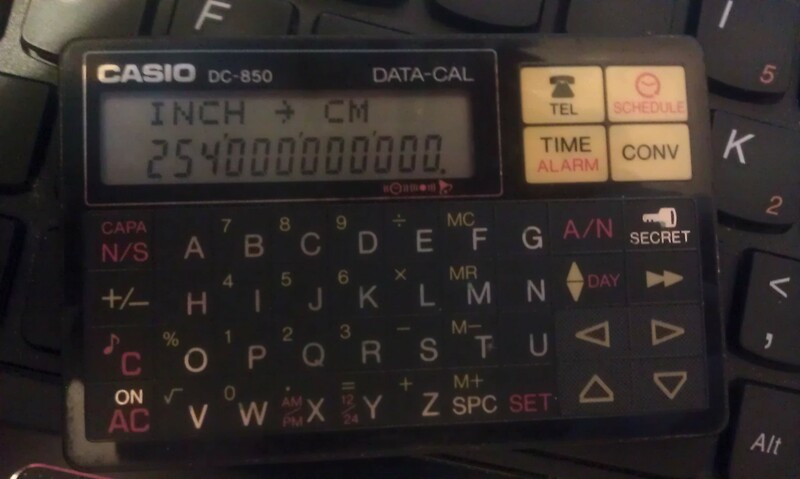 There are not much standard calculator these days with unit conversion so convenient as the DC-850. Just select the unit to convert using the up/down arrow keys, type in the value, and select from which to which simply using the left/right arrow keys. Ok 100,000,000,000 inch equals 254,000,000,000 cm, thank you very much. Notice also the thousands separator and the number of digits it supports. I so wish Casio will bring back this line of product with the same level of quality. This entry was posted in Casio, Data-Calc, vintage and tagged Casio, Data-Calc, DC-850 on January 3, 2015 by gmgolem.